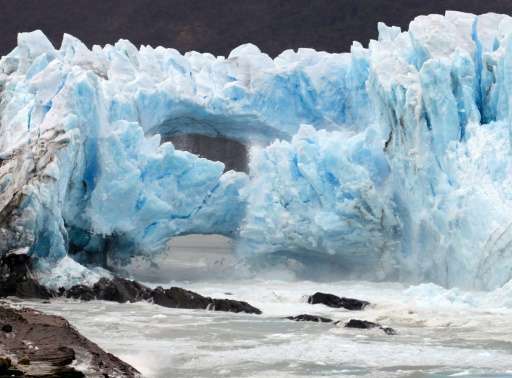 A fragile arch of ice at the tip of a glacier in southern Argentina spectacularly collapsed into the water Thursday, a natural display that happens just once every several years. 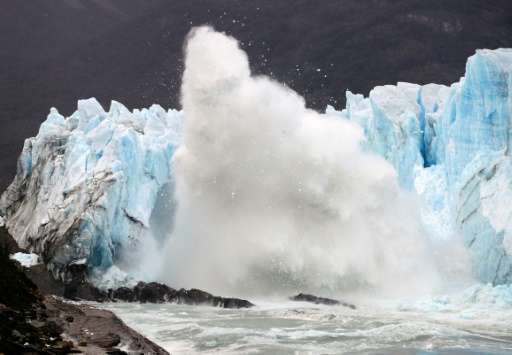 Thousands of tourists had gathered at the Perito Moreno glacier hoping to see the collapse of the pale blue bridge that had formed between the glacier and the shore of Argentino lake. Such arches form roughly every two to four years, when the glacier forms a dam of ice that cuts off the flow of water around it into the lake—until the water breaks through, opening up a steadily wider tunnel that eventually becomes a narrow arch... and then collapses. The phenomenon, which is not linked to climate change, is due to Archimedes's principle, which holds that the buoyant force exerted on a body immersed in fluid is equal to the weight of the fluid displaced, explained Glaciarium, a research center and glacier museum in the Argentine Patagonia region. "When that force causes the ice to detach from the shore, water begins filtering through and the process of breakdown begins, which is irreversible," said Glaciarium. The last time such an arch collapsed was in 2012, but no images exist because it happened at 3:45 am. This time, the bridge fell at 10:55 in the morning, drawing shrieks of excitement from the more than 3,000 tourists watching and training cameras, camcorders and cell phones on the mass of ice. Luciano Bernacchi, director of the nearby Calafate Ice Museum, said the arch measured about 250 meters (275 yards) wide and 70 meters high. The glaciers of the Patagonia region at the tip of South America are the third-largest concentration of ice in the world, after the North and South Poles. Perito Moreno, a UNESCO World Heritage site, sprawls across 250 square kilometers (nearly 100 square miles) and draws thousands of tourists each day.